It may seem counter-intuitive to look for mushrooms on a hot, dry July day. Most Michiganders think of hunting for morels from mid-April thru May. But local expert, Sister Marie Kopin, will tell you mushrooms can be found here nearly year-round. 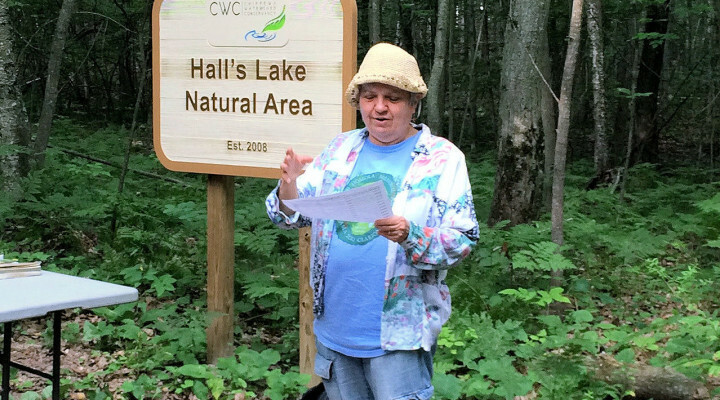 On Saturday, July 25, 2015, sixteen hunters took to the trails at the Hall’s Lake Natural Area and found a wide array of mushrooms despite the conditions. Not everything one finds is edible, or palatable, but the shapes, colors and variety make for an interesting day of exploration. Much of the fun comes after the group returns to sort out their finds and determine what is truly tasty rather than just colorful or unusual. There will two more opportunities to learn about our mushrooms when we meet for walks on Thursday, August 27th at the Hall’s Lake Natural Area, and again on Saturday, August 29th at Sylvan Solace Preserve.